X-Acto X811 No.11 Blades for Xacto Knife x 100: Precision light cutting trimming. For delicate, precision cutting, detailing, trimming and stripping. Easily cuts paper, plastic, balsa, thin metal, cloth, film, acetate, and more. 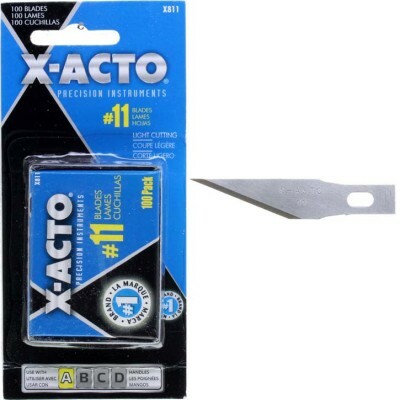 Offering an extremely sharp point for fine-angle cutting, stripping, and trimming, these blades fit #1 and #3 X-Acto knives. The stainless steel blades resist corrosion and won't rust. Modified blades have a broader tip to provide a stronger more flexible point. You're reviewing: X-Acto X811 No.11 Blades for Xacto Knife x 100: Precision light cutting trimming.